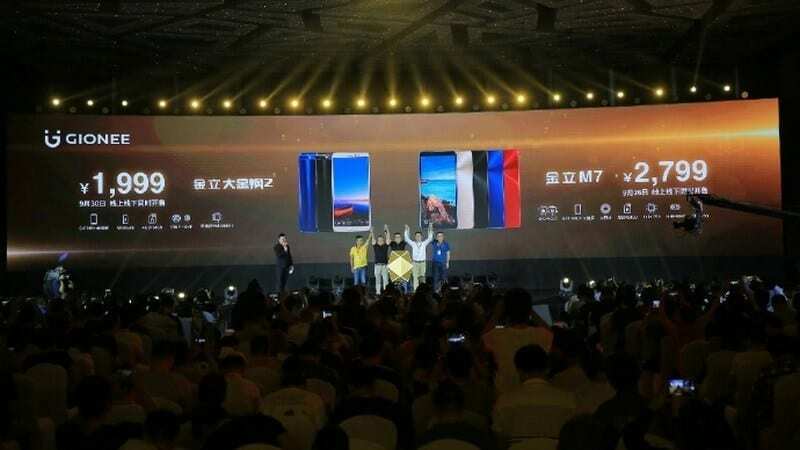 Gionee recently announced its latest mid-range smartphone pair; the Gionee M7 and Gionee M7 Power, which is part of the ‘M Series‘ phone line in China. Notably, the M7 Power (Big Gold Steel 2) will be presented at an event in Thailand this weekend. Specifically, the M7 is equipped with 6.01 inch (2160 × 1080 px) 18: 9 AMOLED screen, 16 + 8MP dual camera, 4,000mAh battery (fast charge support). On the other hand, the M7 Power features a full-size FullView screen, 6 inches HD, 18: 9 aspect ratio, Snapdragon 435 processor and up to 5,000mAh battery. The 6.01 “FullView 6.01” large screen with 18: 9 FHD + resolution is curved at 2.5D. The 2.3 GHz MediaTek Helio P30 with ARM processor Mali-G71 MP2. Owning 6 GB of RAM, 64 GB ROM, support for 256 GB expandable memory card. Runs Android 7.1.1. Amigo 5.0 interface. The following dual cameras include a 16MP primary camera with LED flash, f / 1.8 aperture, 6P lens, 8MP rear camera. Size: 157 × 76 × 7.2mm; Weight: 180g. 4.000mAh battery supports fast charging. 3.5mm audio jack, 4G VoLTE, 802.11 ac (2.4 + 5GHz) Wi-Fi, Bluetooth 4.2. Full screen size 6 inch curved 2.5D 18: 9 (1440 x 720 px). Snapdragon 435 8-core processor clocked at 1.4GHz, the Adreno 505 GPU graphics chip. 4 GB RAM, 64 GB internal memory, 256 GB expandable memory with a microSD card. 13MP primary camera with LED flash, f / 2.0 aperture, PDAF focus. The fingerprint sensor on the back. Dimensions: 156.3 x 75.6 x 8.6mm; Weight: 187g. 5.000mAh battery with fast charging. The Gionee M7 is available in grey, Sapphire, Star Blue, Maple Red, Champagne Gold and Black, priced at 2,799 yuan ($423) tomorrow. Gionee M7 Power is available in blue, black and yellow, priced at 1,999 yuan ($301.96 US dollars) and will be available in the world’s most populous country on September 30. What do you feel about the specs as well as the price of the two new Gionee products has just released, drop your comments!